This 12x10mm, 6 carat Champagne CZ sits in a 14kt yellow gold basket. Set in a gorgeous, oval basket (very solid) that lets the Champagne CZ do it's thing, and is accented with a well cut 3mm CZ. I love Champagne CZ. Available in white gold. All product stamp 14K gold. 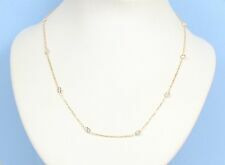 This is Beautiful Tiffany Style 14k Yellow Gold Cubic Zirconia CZ by the yard 18" Necklace. The length of this necklace is 18". The necklace secure with lobster clasp. Oh, you ask, just what IS Padparadsha Sapphire?. Well, it's basically a bright Orange Sapphire from the mining district of Padparadsha, India. I's essentially played out now, but 20 years ago, it was producing Orange Sapphire with the most amazing play of red and yellow fire. Settings: 10KT Yellow Gold, Stamped 10kt. Stamped 10kt. Genuine Cubic Zirconia. Gemstone Size: 6mm with 2mm accent. Shape: Heart. Color: Pink. Cut: Excellent. YELLOW GOLD MATT FINISH 925 SILVER CZ STONE GIFT PENDANT NECKLACE L- 16, 18, 20"
Metal: Yellow GoldStyle: PendantLength: 16 - 17.99"
This gorgeous 7 carat Padparadsha CZ sits in a 14K yellow gold basket. Oh, and it's affordable. I can't even guess what a real one this size one run, but it'd be in the 5 digits for sure. CLEMSON FANS - SHOW YOUR COLORS! Oh, you ask, just what IS Padparadsha Sapphire?. Well, it's basically a bright Orange Sapphire from the mining district of Padparadsha, India. I's essentially played out now, but 20 years ago, it was producing Sapphire with the most amazing play of red and yellow fire. Jerusalem Cross Pilgrim Pendant Yellow Gold 14kt solid white crosses. This NEW Jerusalem Cross Pendant. This is real solid 14kt solid gold can be appraised and tested at any laboratory across the globe. The Necklace has natural pearl and lapis lazuli beads. Estate 14k Yellow Gold Necklace with ELEPHANT. The Elephant part of the necklace has 3 Round CZ clear Stones. Stamped 14k. The Necklace is 16.5" long. ➳14k Gold Unique Peacock With Beautiful Blue & CZ Stones. ✓ Handcrafted with Fine 14k Gold. 4.0 Grams of Gold! FLATTER YOURSELF BY ADORNING THIS. GET THAT MAGICAL APPEAL WHICH WILL LEAVE ONE AND ALL SPELLBOUND! EXCELLENT QUALITY, TRENDY AND EASY ON THE POCKET! GREAT VALUE FOR MONEY PROPOSITION! GOLD JEWELRY IS HANDMADE DESIGNER JEWELRY. 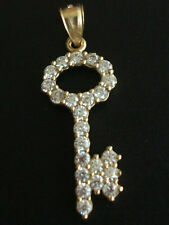 GORGEOUS 10k Solid Yellow Gold Key Pendant with Cubic Zirconia. 10k stamped. AAA grade top quality Cubic Zirconia. 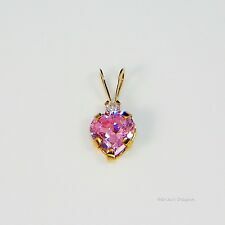 Pendant Size: 10x30mm. Minor blemish may exist due to being a natural pearl / gemstone. MONITOR BRIGHTNESS / CONTRAST SETTING ETC. GOLD JEWELRY IS HANDMADE DESIGNER JEWELRY. WE ARE MANUFACTURER OF ALL KIND OF SILVER GOLD & STONES JEWELLERY.”. PENDANT SET SPECIFICATIONS. GIVE US A CHANCE. Features hidden Loop on top of pendant to be worn with comfort. The gold pattern is a simple classic bezel pattern with the simulated diamond featured on the inside. Combined weight for necklace and pendant is 9.40 Grams, length is 18". 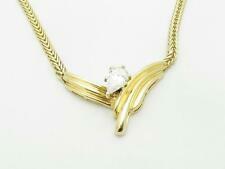 Our 10K SOLID Gold Jewelries are made by Hand and are in vary high quality. They are all stamped for authenticity. Item is enlarged to show detail. Take your pick! Pendant is made of pure gold and is NOT gold filled. The Pendant is topped off with dazzling Cubic Zirconia stones (5). -"14k" stamped onto the pendant itself for legitimate purposes. MADE WITH 14K YELLOW GOLD. 585. FREE JEWELRY BOX INCLUDED! STONES: CUBIC ZIRCONIA. THIS NECKLACE IS PRE-OWNED. COLOR: GOLD TONE. SIZE: 16" LENGTH. Get Images that. Make Supersized Seem Small.